Isn't this cute? It's so round and bulbous and just generally kawaii. 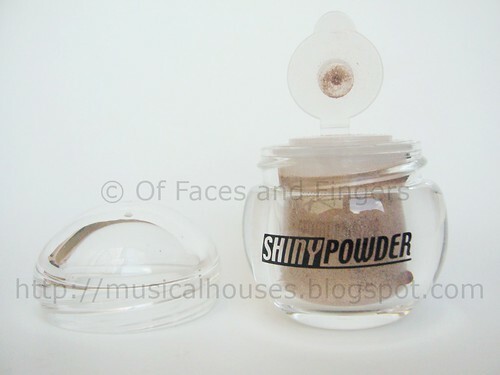 It's Daiso's Shiny Powder in Brown, and it was a little cheapie I came across while trawling through Daiso. For the uninitiated, Daiso is the Asian equivalent of Poundland or the Dollar Store. It originated in Japan, but its stores can be found elsewhere throughout Asia. Much like Poundland or the Dollar Store, it sells a mishmash of random products - everything from stationary to household items - but for a beauty addict like me, it also carries a line of super-cheap makeup and nail polish. And when I say super-cheap, I mean it - the items are just a couple of dollars. And I'm talking about Singapore dollars here, not pounds or USD. Awesome! The Daiso Shiny Powder is a loose powder that's billed as being multipurpose, but in this colour, Brown, it's really more of a loose eyeshadow. The packaging is cute - there is a round twist-off cap, and under that there's another flip-top lid. Its sturdy and powder doesn't fall out of the packaging (unlike the Superdrug MUA line - the powder leaks like nobody's business). So cheap it is, and kawaii it is. But is the Daiso Shiny Powder really worth it? This is the part where I have to confess - not really, but I wouldn't complain for the price. And, I've seen makeup of similar quality go for higher prices. 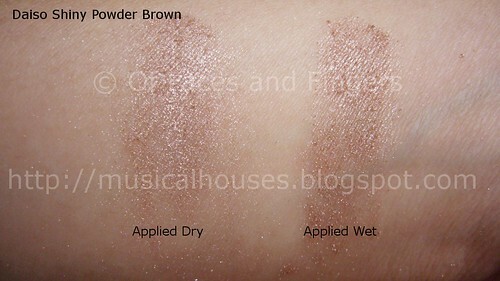 Here's a swatch of the Shiny Powder in Brown. 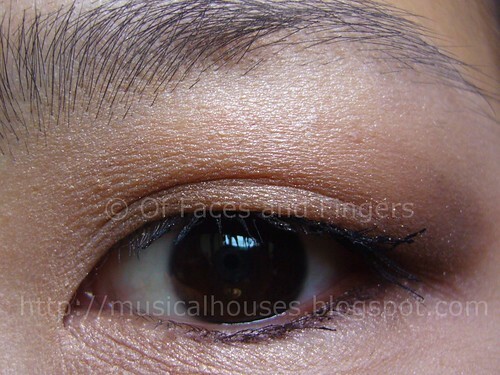 The brown colour itself is a pretty nice colour - it's a light fawn brown that leans warm, with a medium amount of shimmer. But while I like the colour, I have to say pigmentation wasn't that great. And I thought it would improve if I foiled the colour, but for some reason there wasn't that much of a difference. But then again, in my laziness, I simply foiled the eyeshadow with water, which might not have been sufficient for foiling. Still, you'd think that for purposes of a swatch, even water would have helped more. As evidenced by the swatches, pigmentation is rather light. To be fair, it's not so sheer that it doesn't show up, because you can definitely see the colour on my eyes. But it's a very light shade. On my eye, it also pulls a little bronze, although not in a bad way. It's a nice shade, really. Pity about the pigmentation. So, do you need this? You probably don't, but if you happen to be in Asia and are looking for cheap makeup, this is definitely something worth checking out. 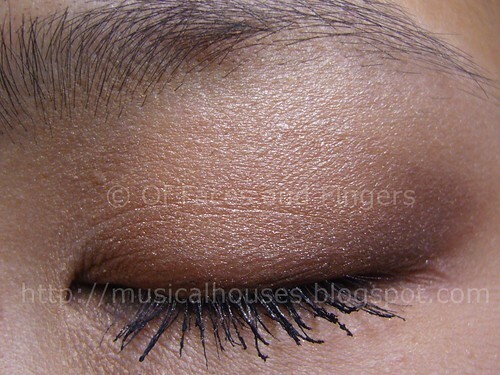 And as I've mentioned before, makeup lousier than this has gone for higher prices, so it's not like it's that awful. I personally wouldn't complain given the price, but I'm just pointing out that if you're willing to spend, there is better out there. But if nothing else, there's always the adorable, kawaii packaging to induce your buying tendencies. Oh, I love Daiso!! We have a bunch of them over here and I always go in and buy lots of stuff that I don't need! I bought this new topcoat today, it's called Like Gel Nail Top Coat. I heard they are coming to Sydney. I'm really interested in trying them out! I'd get it just for the packaging really. thanks for dropping by my blog! nice to see more asian bloggers around! definitely following you!